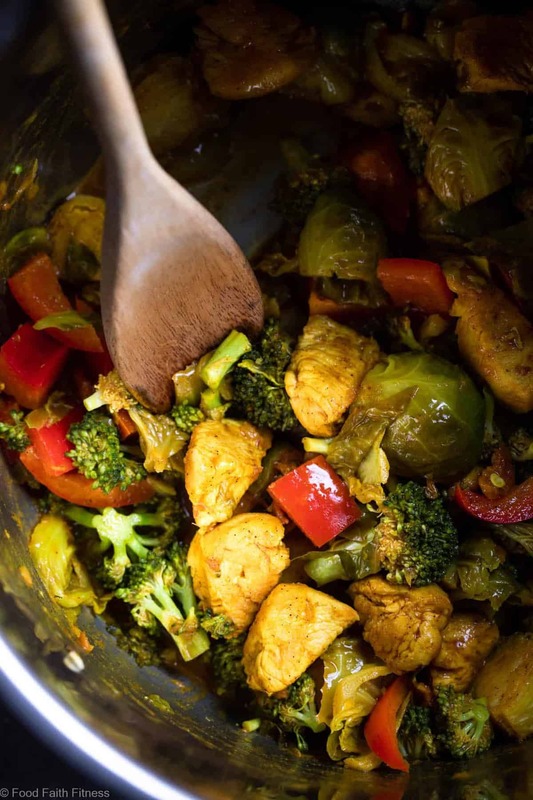 This Instant Pot Turmeric Chicken and Vegetables is an easy, quick and healthy meal with bold flavor! It’s paleo friendly, whole30 and low carb and keto too! Turmeric! Turmeric! Bright, sunny, spicy turmeric! 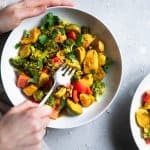 When I did the reader survey at the beginning of the year you guys asked for more turmeric recipes, more Instant pot recipes and more low carb recipes. So, here you go. All the things you want in ONE super simple, good-4-you kinda meal. Our story begins, as all good stories do, with sizzling smooth coconut oil dancing across the base of our Instant pots. Then juicy little nuggets of chicken come onto the scene, wrapping themselves into the coconut oil hug and getting golden brown and GLORIOUS. It’s not a story without a weather update and it looked like it was cloudy with a chance of COCONUT MILK showers that day. Coconut milk that was mixed with spicy turmeric and cinnamon, a flavor punch of fresh ginger and a twirl of tomato paste to bring allll the flavors together, that is. 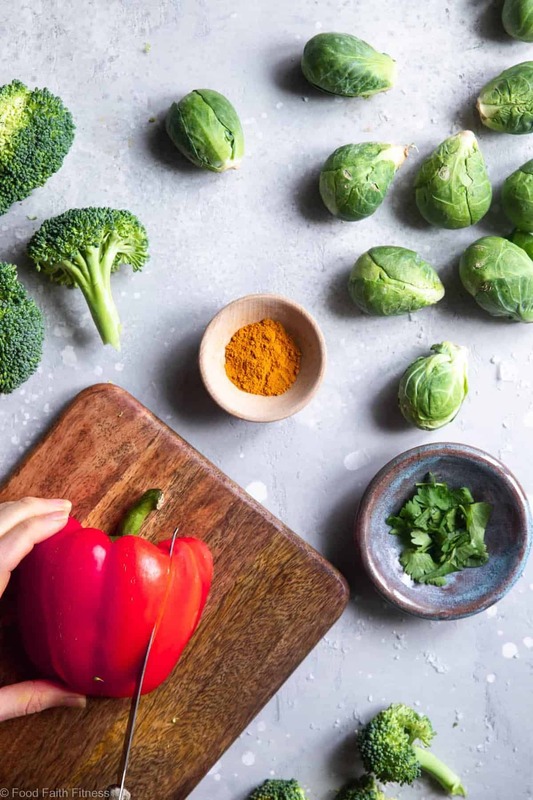 Because it’s instant pot vegetables, then came the Brussels sprouts, later to be joined by tender-crisp broccoli and slivers of VIBRANT red pepper. Should probably make it a published novel. Maybe work on the ending though. That was a little abrupt no? Turmeric is considered an anti-inflammatory. Although short-term inflammation is good for your bodies, it becomes a problem when it’s chronic and starts to attack our bodies own tissues. Studies have shown that inflammation occurs with every Western disease, so turmeric can play a role in preventing and treating these diseases! Okay my internet friends. I try not to boss you around on the reg’ but today is not one of those times. I had to test this pressure cookie chicken and vegetables recipe 6 times (Mr. FFF was VRY VRY over it at the end of the week) to make the veggies right. They were either a pile of non-descript veggie MUSH OR basically the same texture that they were when I stuck ‘em in the post. Just too dang crunchy. 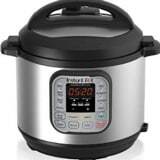 The secret to cooking vegetables in the Instant Pot is to use a combination of high pressure and the natural steam that the high pressure makes! You want to cook your heartier vegetables (like Brussels sprouts) under high pressure for just ONE MINUTE. <— Yep, only one minute. I tried 3 minutes and it was like vegetable soup. You want to cook your daintier vegetables (like peppers and broccoli) by doing a quick steam release, throwing them in (diced nice and small!) covering the pot and letting them steam for 10-15 minutes. VOILA! Perfectly soft Brussels and tender-crisp broccoli and peppers! 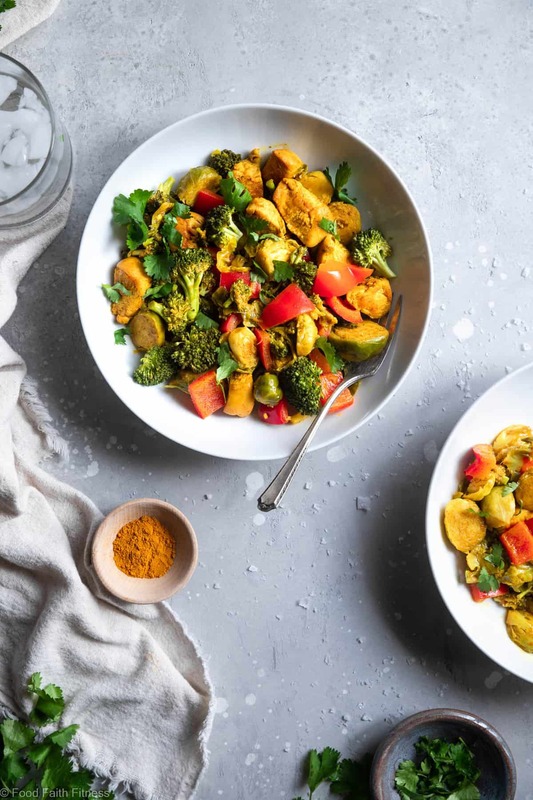 Turmeric is what gives curry it’s golden color, so this little bowl of golden goodness is going to give you Instant Pot Tahini Cashew Curry and mango chicken curry vibes, but with this subtly smooth flavor profile of cinnamon and tomato tingling across your taste buds. 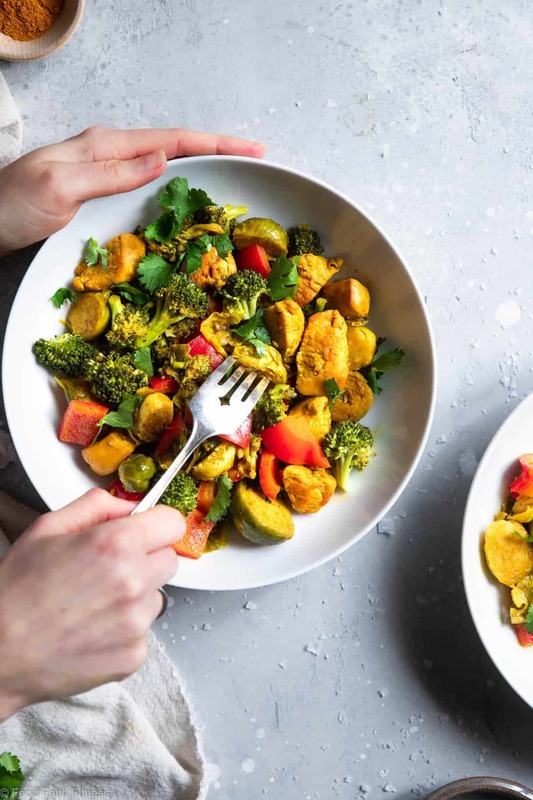 If you want to make this Instant Pot turmeric chicken and vegetables a little heartier, you could serve it with a side of rice or cauliflower rice. But Mr. FFF and I found this plenty filling on it’s own if you’re not looking for a super heavy dinner! Feel your inner golden goddess GLOW. 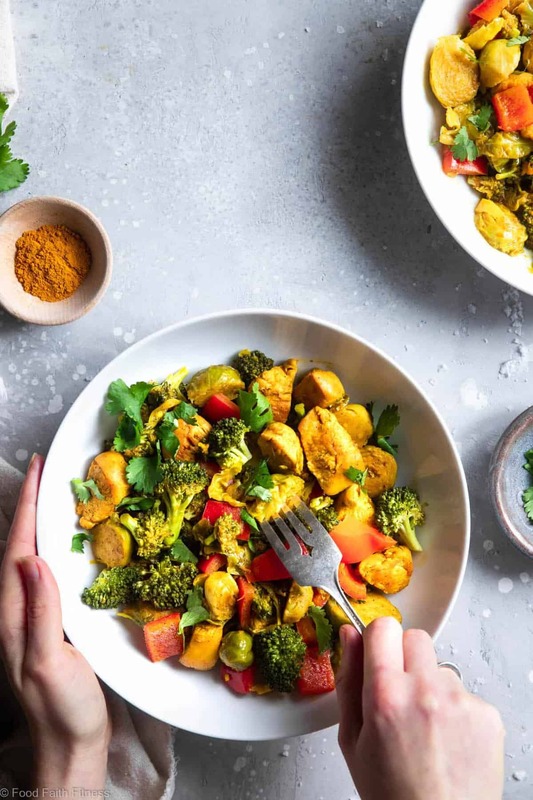 This Instant Pot Turmeric Chicken and Vegetables is an easy, quick and healthy meal with bold flavor! It's paleo friendly, whole30 and low carb too! Pour 1 1/2 Tbsp of the coconut oil into the IP and turn to sautee mode. Once hot, add in the chicken and cook until lightly golden brown and no longer pink inside, about 4-5 minutes. While the chicken cooks, whisk all the ingredients (and the remaining oil) up to the Brussels sprouts together until smooth. Once the chicken is cooked, pour into the IP. Add in the Brussels sprouts, stirring to coat into the sauce. Cover the IP (make sure it's set to sealing) and change to manual mode. 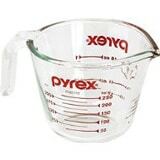 Set it at high pressure for 1 minute. 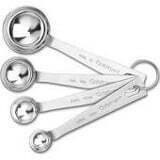 Once cooked, immediately do a quick release. Once the steam is released, throw in the broccoli and peppers, stirring to coat. Cover with the lid and let sit 20-25 minutes, or until the veggies are steamed. Total time should be about 40-45 min, not 10.